One of the most frustrating parts about cooking happens after tummies are full — clean up. As wonderful as home-cooked meals are, it often comes at the price of a load of dishes. But tasty dishes don’t have to require lots of dishes, or even lots of prep. 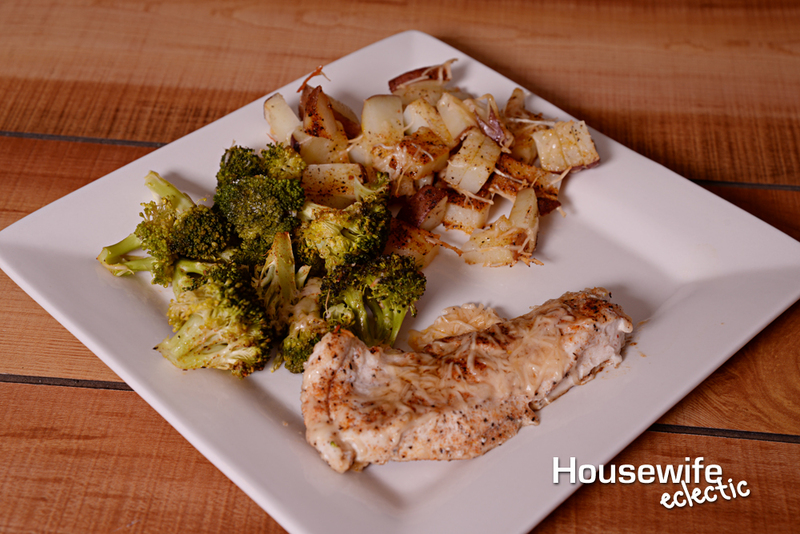 Take, for instance, this delicious One-Pan Parmsean Chicken, Potatoes and Broccoli. Your dish load will consist of a cutting board, a knife, and a baking sheet. Oh, and the food is incredible! When I need a quick fix meal that hits the spot, this is one of my favorites. Not only is it fast, and easy on the dishes, the flavor is amazing and I’m always satisfied. Cover your baking sheet with tinfoil and coat with cooking spray. Cut the potatoes into thin round slices and lay the slices on one-third of the cooking sheet. Cut the broccoli crowns down to small pieces and lay on another third of the cooking sheet. Prepare your custom seasoning blend by mixing the salt, garlic powder, onion powder, black pepper, paprika, and parsley in a bowl. Sprinkle the seasoning blend on both sides of your chicken breasts and lay the chicken breasts in the tinfoil boat you prepared. Sprinkle the same seasoning blend over the potatoes and broccoli. Lightly coat the potatoes, broccoli, and chicken with some olive oil. Sprinkle the shredded Parmesan cheese over the potatoes, broccoli, and chicken. Go on, be generous with the cheese! Bake at 400 degrees for about 22-25 minutes, or until the chicken is cooked through and the potatoes get a nice brown crust. This dish comes together so quickly and the three elements work so well together. 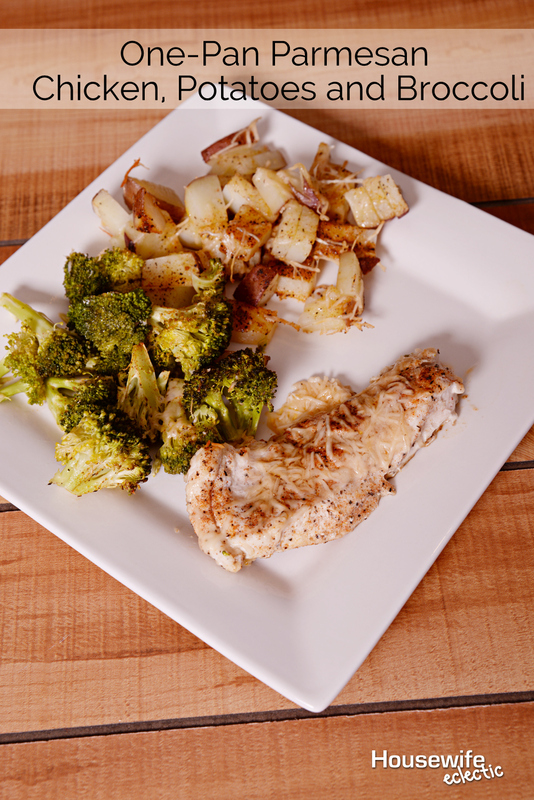 The chicken is tender and the Parmesan and seasoning blend really bring out the flavor in the broccoli and potatoes. Dip it in a little ranch dressing and you’re in business! This dish is one of my toddler’s favorite. I’m not sure she even realizes she’s eating broccoli, so I’ll count it as a win! This is everything I like about a weeknight meal. Easy and delicious with good classic ingredients! This sounds so good! I love that it is simple to make, sometimes quick and easy is what is needed for our dinner! You make all of that in one pan?! Dang girl, I need to come to your house for dinner! I love a one pot (sheet) dinner! How easy and it looks simply delish!! Thanks for sharing this recipe! I love sheet pan meals! I'll have to add this to the menu at our house this week! I love one meals cooked in one pan. Looks delicious!